You might have seen the recent video where Buzzfeed staff in the US decided to try out some Irish ‘snacks’. I’m not sure that many Irish people snack on black pudding. That’s not to say that we don’t like it. The only person who won’t eat it in the family is the 15-year-old, simply because she prefers the white version, straight from the casing. Before you get worried about eating raw meat product;, pudding is cooked in the casing before going on sale, it’s traditionally cooked a second time before eating at home – but it is perfectly safe to eat chilled. It’s always the traditional foods that cause the most debate in this house. I like to cook my pudding in the grill pan by sitting it underneath the sausages and rashers as they grill above. That way the juices soak down and you get a double-whammy of salty porkness (this is a technical term in our house). My hubby on the other hand quite likes his pan-fried in a little bit of oil to get the rounds of black pudding crunchy on the outside and soft on the inside. Black pudding freezes very well and it’s one of the items that I always keep in my freezer. When it came to supper yesterday, I used a combination of freezer and store cupboard items to make this meal. Heat the oil to on a medium heat in a large non-stick frying pan. Fill half of the frying pan with the rounds of black pudding and the other half with the sliced red onion. Turn every now and again. Sizzle the black pudding until it’s crispy on both sides, the onion should be seared and beginning to turn translucent. Put the frozen beans and broken noodles into a large, heat-proof bowl and cover with boiling water. Drain after 5 minutes and pour the noodles and beans into the frying pan. Toss all the ingredients together, breaking up the crispy black pudding as you go. Serve while still hot. If you’re looking for a dressing, you could squeeze over a little lemon juice, or even have some sriracha or sweet chilli sauce on the side. Hehehe it’s a real topic of debate here! 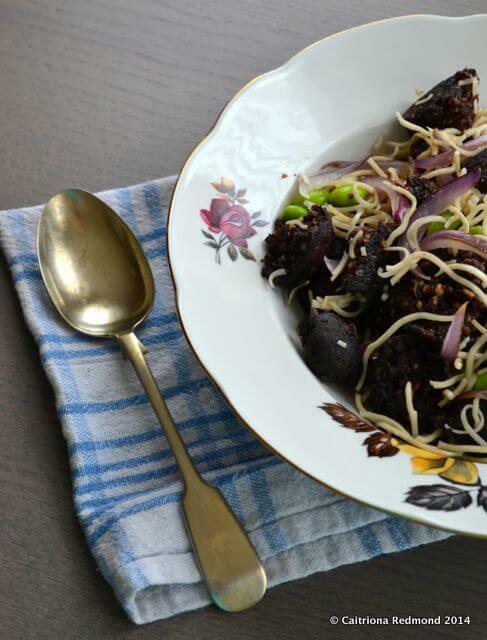 I love a good black pudding salad, especially with red onion – their sweet flavour when cooked complements the pudding’s saltiness really well. And yes a double whammy of salty porkness is even better. Indeed a drizzle of balsamic is a great combination alright. Porkness factor is important! Much as I respect your good self I have to agree with your husband here. But most of all I am bored to the back teeth of black pudding being squeezed onto every menu in Ireland, mostly with scollops. I love black pudding, but its being over used now and needs to have a rest before it becomes like coleslaw or a side of crisps on a sandwich. Protect the pudding! Seeing as I rarely make it into a restaurant these days, I’m not subjected to black pudding with scallops. Thankfully. 😉 Black pudding with scallops sounds a little bit over-the-top to me, served with pea puree or cauliflower I take it? Old hat! Each to their own on the way it should be cooked mind you, so long as it’s decent pudding.